I am using SQL Server 2008, but not the spatial features. I have a table with few entries, only 40,000. There is an id INT PRIMARY KEY column and two columns storing a 2d coordinate, both decimals. This is taking 15 minutes to run at times. Of course using spatial abilities would be a better way, but it is possible to make do with plain SQL. This will also work in SQL Server 2005. In most database engines, the spatial indexes are implemented as the R-Tree structures. SQL Server, however, uses another approach: surface tesselation. Basically, it divides the surface into a finite number of tiles, each assigned with a unique number. The identifiers of tiles covered by the object are stored as keys of a plain B-Tree index. When SQL Server's optimizer sees a geometrical predicate against an indexed column, it calculates the numbers of tiles that possibly can satisfy this predicate. Say, if the tiles are defined as squares with side 1, the predicate column.STDistance(@mypoint) < 2 can only be satisfied by the objects within 2 tiles away from @mypoint's tile. This gives a square of 25 tiles with @mypoint's tile in the center. The tile numbers can be found and searched for using the index. Exact filtering condition is then applied to each candidate value returned by the index. Same solution can be used in our case even without the spatial functions. Comparing tile numbers is an equijoin and hash join method is eligible for this operation. We can even choose the tiling algorithm individually for each query, since we don't have to store the tile identifiers in the table, and the hash table will be built dynamically anyway. I need to remove all rows from table1 which are not present in table2, but there can be duplicates in both tables and writing more than 70 IS NULL conditions would be a pain, and I want to make sure there's nothing I'm missing. SQL Server supports EXCEPT clause which returns all records present in the first table and absent in the second one. But this clause eliminates duplicates and cannot be used as a subject to a DML operation. ANSI SQL standard describes EXCEPT ALL which returns all records from the first table which are not present in the second table, leaving the duplicates as is. Unfortunately, SQL Server does not support this operator. Similar behavior can be achieved using NOT IN or NOT EXISTS constructs. But in SQL Server, IN predicate does not accept more than one field. NOT EXISTS accepts any number of correlated columns, but it requires extra checks in the WHERE clause, since equality operator does not treat two NULL values as equal. Each pair or nullable columns should be additionally checked for a NULL in both fields. This can only be done using OR predicates or COALESCE, neither of which adds to performance. But there is a way to emulate EXCEPT ALL in SQL Server quite elegantly and efficiently. TranxAmt can be positive or negative, so the running total of this field (for any ItemID) will go up and down as time goes by. Getting the current total is obviously simple, but what I'm after is a performant way of getting the highest value of the running total and the TranxDate when this occurred. Note that TranxDate is not unique. SQL Server is a very nice system, but using it for calculating running totals is a pain. Oracle supports additional clauses for analytic functions, RANGE and ROWS, which define the boundaries of the function's windows and hence can be used to implement running totals. By default, it is just enough to omit the RANGE clause to make the analytic function apply to the window of the records selected so far, thus transforming it to a running total. SQL Server's support for window functions only extends aggregate capabilities a little so that the aggregate can be returned along with each record that constitutes the group. For functions like SUM and COUNT it is impossible to control the window boundaries and the records order. Such analytic functions can not be used to calculate running totals. The common way to write such a running total query is using a subquery or a self join which would count the SUM of all previous records. However, the complexity of this query is O(n^2) and it's not usable for any real volumes of data. This is one of the few cases when the cursors are faster than a set-based solution described above. But we all are aware of the drawbacks of cursors and better search for something else. This task, fortunately, is a little more simple than it may seem, because it deals with dates. The number of all possible dates is usually limited and a recursive query can deal with this task quite efficiently. How do I add Mode to this query? A quick reminder: in statistics, mode is the value that occurs most frequently in a data set. In other words, for each e_id, mode is the (exact) value of scale shared by most records with this e_id. Unlike other statistical parameters used in this query, mode is not guaranteed to have a single value. If, say, 10 records have scale = 1 and 10 other records have scale = 2 (and all other values of scale are shared by less than 10 records), then there are two modes in this set (and the set, hence, is called bimodal). Likewise, there can be trimodal, quadrimodal or, generally speaking, multimodal sets. This means that we should define a way on how to choose this mode. How do I select the whole records, grouped on grouper and holding a group-wise maximum (or minimum) on other column? In this article, I'll consider SQL Server. SQL Server has very rich SQL syntax and its optimizer is really powerful. However, some tricks are still required to make the queries like this to run faster. SQL Server: are the recursive CTE’s really set-based? I've read your article about adjacency lists vs. nested sets in Oracle. A nice explanation, thanks. You write that recursive operations are row-based in Oracle and set-based in SQL Server. Which approach is better in your opinion? First, a quick reminder for those who have no idea what's this all about. Recursive queries are useful to build the hierarchy trees, traverse graphs, generate arbitrary rowsets etc. Usually this involves joining a set with itself an arbitrary number of times. A recursive query is usually defined by the anchor part (the initial rowset, or the base of recursion) and the recursive part (some operation over the previous resultset). This is same as with the plain recursion: take some initial data as a parameter, modify it in some way and then pass the result of the modification as a new parameter to the same function. Since SQL operates with sets, the input and the output if this function should also be the sets. And here is the main differences between the approaches used by Oracle on one side, and SQL Server, PostgreSQL and some more systems on the other side. Oracle uses CONNECT BY approach, while SQL Server uses recursive CTE approach. My table (SQL Server 2008) has more than 1 million records. When I try to order records by datetime, it takes 1 second, but when I order by id (integer), it only takes about 0.1 second. Is there any way to improve the efficiency? However, everything's not so simple. A record means that the given resource is busy. I need to produce a list of all resources that are available for at least X consecutive days in a given time interval, e. g. from 2009-01-01 to 2009-01-20 and 5 consecutive days. This would be quite an easy task if the table records reflected available resources. We could just check that a resource exists using EXISTS and that it has given length using DATEDIFF. However, the table reflects the busy resources. 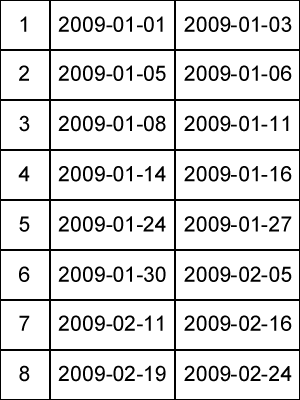 This means we should invert the date ranges: given a list of consecutive non-overlapping date ranges, we should build a list of their complements, or the gaps between them.